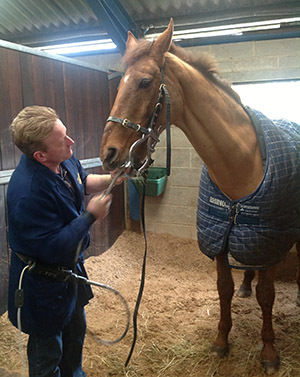 Steve is our horse dentist and has been treating Jeanette’s horses for over 10 years. He has been a dentist for 27 years, and while he mainly works at top racing yards he also treats event horses, grand prix dressage and show jumping horses. He travels and works in Ireland, the Isle of Man, Holland and, occasionally, Hong Kong. He is British Veterinary Association qualified. We love how Steve is very patient and calm with all our horses – he always works independently which keeps the horses relaxed.